Tomorrow I am joining the massive amount of New Yorkers hailing a cab early in the morning, loaded down with luggage and heading to the airport. My little (and I do want the emphasize little) airplane will battle the impending winter storm and transport me to the mountains of Virginia. Home for the holidays, though sadly without my favorite guy. Going home means family, relaxation, sweet tea, and homemade cookies. It means I am in the South again, where life is a little slower, a little sweeter. This is my take on the pecan pie, a classic Southern treat. 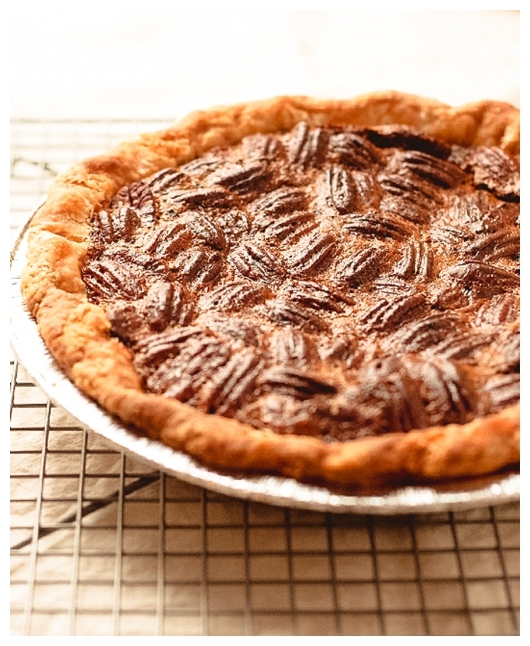 While I love all things sweet, I sometimes find pecan pie to have a rather cloying sweetness. To balance the sweetness, I add a thin layer of bittersweet chocolate to the bottom of the pie shell. Enjoy your slice of pie with a dollop of whipped cream or with my favorite accompaniment, a scoop of Bourbon Ice Cream. Make the pie crust: Whisk the dry ingredients together and blend with a hand-held pastry blender the chopped, cold butter, being careful not to overwork. The butter should be in pea-sized chunks, not too big, but not completely incorporated. Slowly add the ice water and vinegar mixture and bring the dough completely together by hand, again being careful not to overwork. Aim to create a marbleized effect, so that the butter is still visible. Form into a disc, wrap in plastic, and chill at least 1 hour before use. Roll out dough into a 13-inch round on a lightly floured surface with a lightly floured rolling pin. Fit into a 9-inch pie plate. Trim excess dough, leaving a 1/2-inch overhang. Fold overhang under and press against rim of pie plate, then crimp decoratively. Chill at least 1 hour or up to overnight before use. When pie shell is chilled, preheat the oven to 375°F. In a metal bowl set over barely simmering water, melt the chocolate, stirring occasionally. Remove from heat, wiping the bottom of the bowl with a towel. With a small offset spatula, spread the melted chocolate evenly over the bottom of the pie shell. Allow the chocolate to set slightly, then cover with pecans. In a medium mixing bowl, whisk together the eggs, brown sugar, vanilla, and salt, then whisk in the corn syrup. Pour the mixture over the pecans. Bake pie until filling is puffed and crust is golden, 50 to 60 minutes. Cool pie on a rack to warm or room temperature. Pie can be baked 1 day ahead and chilled, uncovered, until cool, then covered. Reheat in a 350°F oven until warm, about 10 minutes. Yeah, yeah, yeah!!! We are so anxious to have you home! Lovely, lovely, lovely looking pie crust there!!! Aha, you're just a couple of ingredients from the unmentionable-in-print Kentucky pie. Add about 1/4 cup of Bourbon and consider substituting walnuts for the pecans, although I usually don't.